For the seventh year running, Veterans Advantage once again honored the military and veteran community during November with events and new benefits as part of Veterans Week NYC 2018. Veterans Advantage and its 2018 sponsors treated VetRewards Card members, VIPs, and fellow veterans and their families to special events celebrating service, including giveaways and gifts, while Veterans Advantage offered 50% discounts on VetRewards Plans throughout the month. Even before the founding of Veterans Week in 2012, Veterans Advantage has been a steadfast supporter of the New York City Veterans Day Parade, the largest of its kind in the country. Each year, Veterans Advantage’s float offers a special "Thank You" from its partners. Sponsors this year include Avis and Budget for its car rentals, IMAX and Wyndham Hotels & Resorts. Avis and Budget, who already provide up to 25% OFF everyday car rentals, each generously offered a free one-week car rental as prizes. Wyndham, which offers up to 20% OFF at its hotels & resorts, provided two awards of free one-week stays at any of its locations worldwide. “We wanted to thank our loyal and wonderful sponsors for supporting our mission during this special time for our nation’s veterans, and specifically Avis, Budget and Wyndham for being VetRewards Exclusive partners every day of the year,” said Scott Higgins, Veterans Advantage Founder and CEO, and a Vietnam Veteran. Starting with the annual Veterans Day parade on 11/11, Veterans Advantage led its float up New York’s historic Fifth Avenue amid the cheers of spectators showing their support of the 25,000+ participants. The next day, Veterans Advantage and IMAX hosted a theatre filled with veterans to a free IMAX movie screening of “First Man,” the biopic about Navy veteran and first man on the moon Neil Armstrong. The film starred Ryan Reynolds and chronicled Armstrong’s personal experiences leading up to the historic space mission in July 1969. After the holiday, Veterans Advantage board member Gerry Byrne hosted two events for New York City Veterans, The Marine Corps Birthday Gala aboard the U.S.S. Intrepid Sea-Air-Space Museum, with special recognition to Marine Commandant General Robert B. Neller, and Variety Magazine’s salute to Veterans. The second event, co-hosted by the History Channel, recognized the service of TV stars Montel Williams (Navy) and Sunny Anderson (Air Force), while also saluting the support of others such as Bob Woodruff, through his Woodruff Foundation, Rachel Ray who has a career history of supporting those who served, and Ken Burns, who continues to produce true-to-life documentaries about war and military service. Veterans Advantage co-founder and CEO Scott Higgins being interviewed on TV during the parade. Sunny Anderson, Foot Network TV star, honored during salute to service hosted by Variety Magazine and the History Channel. Veterans Advantage founders Scott and Lin Higgins lead the Veterans Advantage float with members. 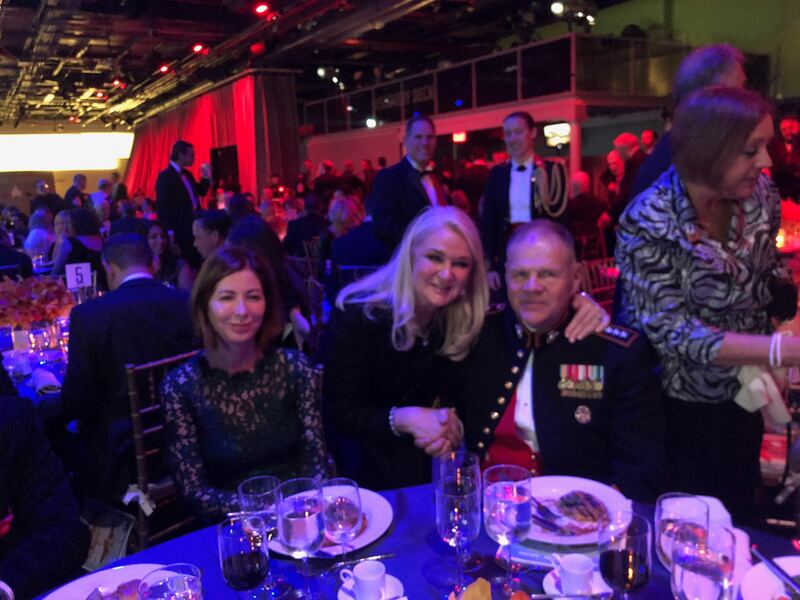 Veterans Advantage co-founder COO Lin Higgins greets Marine Corps Commandant, Lt. Gen. Robert Neller. 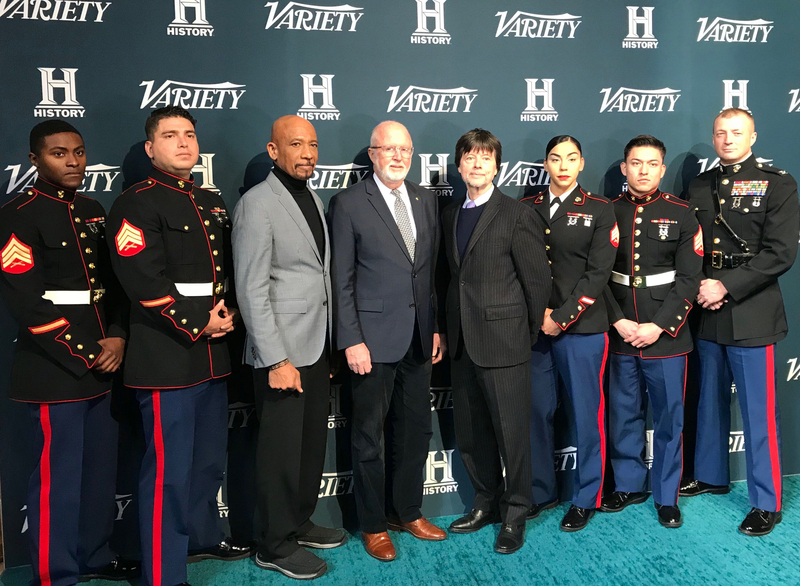 (center l. to r.) Montel Williams, Gerry Byrne and Ken Burns joined by U.S. Marines during salute to service hosted by Variety Magazine and the History Channel.